A publishing destination is a social media account/page that you wish to publish Video Cloud videos to. 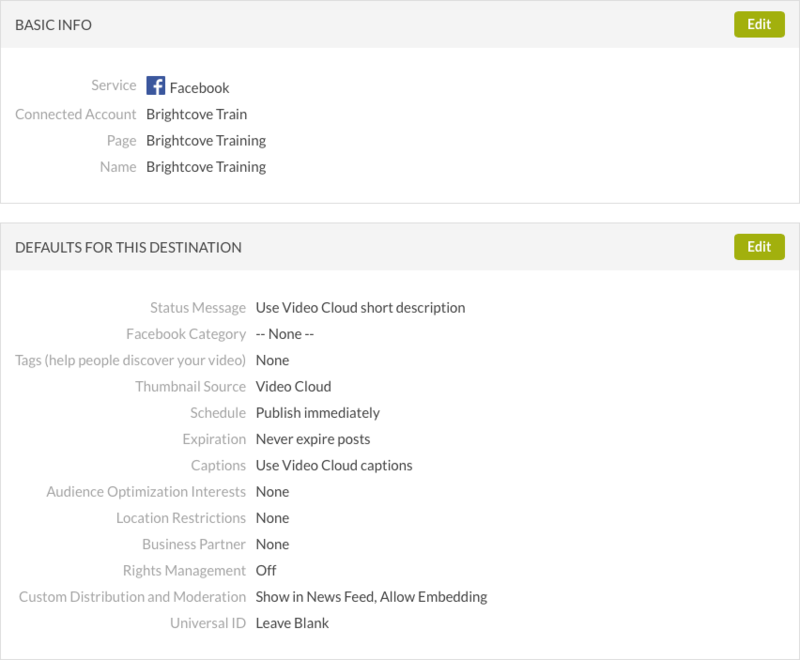 Before you can publish videos to social media accounts using Brightcove Social, you have to create at least one destination. Destinations can be created to publish videos to YouTube, Facebook and Twitter. Create a YouTube destination when you want to publish videos to a YouTube channel. Before creating a YouTube destination, you may want to verify your YouTube account. Once you've verified your account, you will be able to upload videos longer than 15 minutes. To create a YouTube destination, follow these steps. Click Destinations in the left navigation. Click Sign in with YouTube. You will be prompted to login to your Google account (if not already signed in). If you have multiple accounts, make sure you login to the account associated with your YouTube channel. A dialog will open requesting permission to manage your YouTube account. 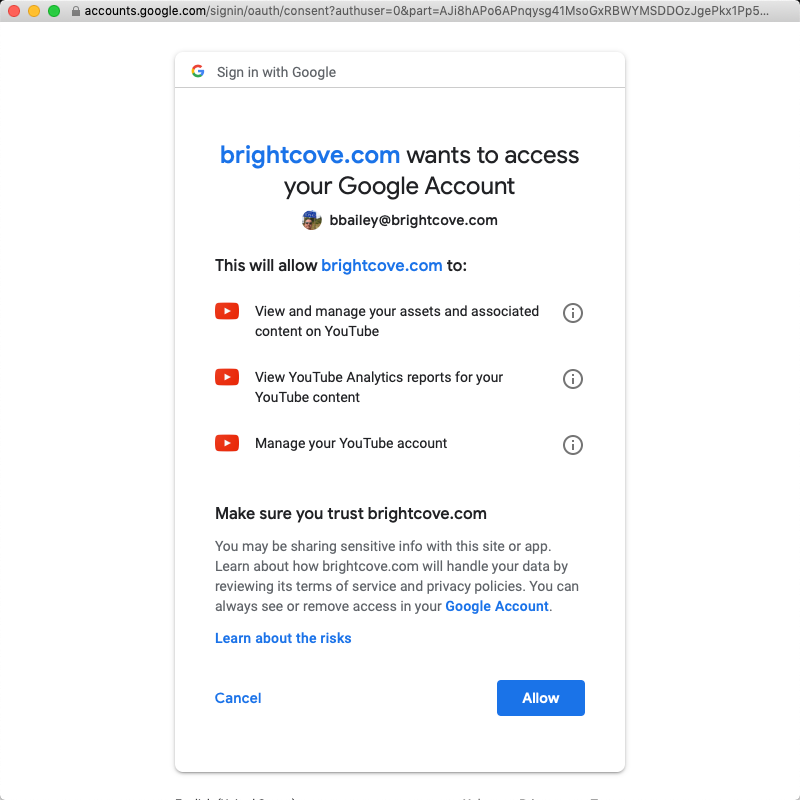 Check the upper right of the dialog to confirm you are using the correct Google account. If not, use the drop down to select the Google account you want to distribute videos to. Click Allow. Give the destination a unique, descriptive name. Click Add. Basic information and the destination defaults will be displayed. Click the Edit button in the BASIC INFO section to edit the destination name. See the Setting YouTube defaults section for information on configuring default values. Click Destinations in the left margin and confirm that the destination appears in the list of destinations. The value below the destination name is the destination ID. Click the Destination Name to edit the destination. Click the link in the Channel/Page column to open the YouTube channel in another browser tab. Use Video Cloud start date - To use the Video Cloud start date set for the video. In this case, we tell YouTube to make the video public as of the 'Scheduled Start Date' specified in Video Cloud. If that date is in the past, YouTube makes the video public immediately. Note: To have the video visibility set to Unlisted or Private, set the Schedule option to Publish immediately and set the Visibility option to Unlisted or Private. Use Video Cloud captions - The Social module will attempt to distribute the captions associated with the video to YouTube. The Social module will attempt to access captions files no matter where they are. If a remote URL is used to specify the location of the caption files and the files are accessible (e.g., not geo-restricted in such a way that we can't get to them) then Social will distribute them to YouTube. 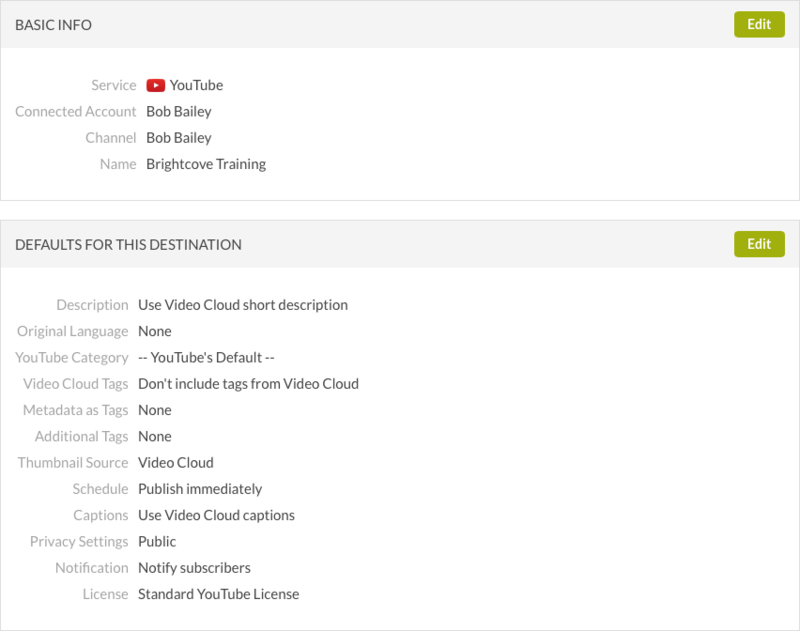 Note: For information on working with captions in Video Cloud, see Overview: Adding Captions to a Video. Use YT_Privacy_Status Custom Field - Dynamically assigns the privacy setting using a custom field associated with the video. For information, see Setting the Privacy Status for a Video. There is also a setting to Notify subscribers when video is posted to YouTube. If checked, your subscribers will see your videos in their Subscriptions feed and may receive a notification that the video was uploaded. Note: For more information on the YouTube Privacy settings, see the YouTube documentation. Note: For more information on YouTube License and Rights Ownership, see the YouTube documentation. Create a Facebook destination when you want to publish videos to a Facebook page. Note that videos can only be distributed to Facebook pages, not personal profile pages. To create a Facebook destination, follow these steps. A dialog will open requesting you to log into your Facebook account. Enter your credentials and click Log In. 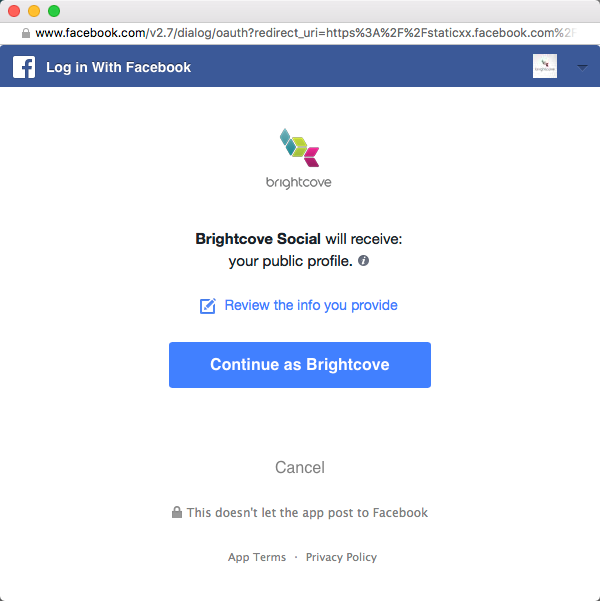 A dialog will open confirming that Brightcove Social will receive your profile info. Click Continue. 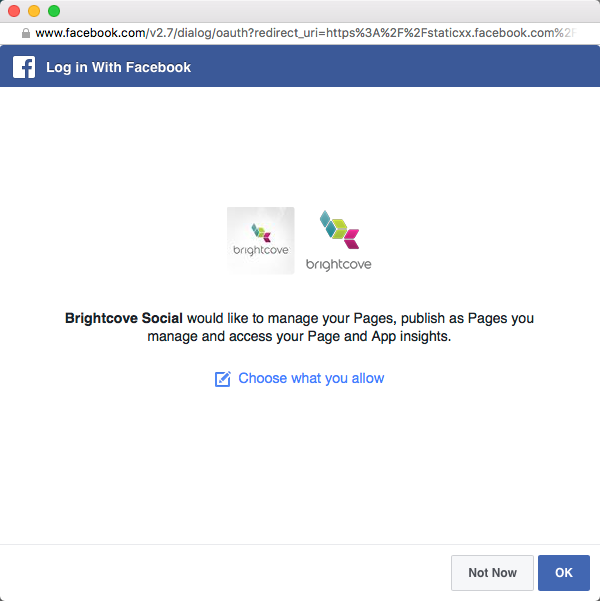 A dialog will open confirming that Brightcove Social will be able to manage and publish your pages and access your Page and App insights. Click OK.
Give the destination a unique, descriptive name. If you have multiple Facebook pages, select the page to publish to using the dropdown list and then click Add. Note: You can't publish videos to personal profile pages. Basic information and the destination defaults will be displayed. Click the Edit button in the BASIC INFO section to edit the destination name. See the Setting Facebook defaults section for information on configuring default values. Click the destination name to edit the destination. Click the link in the Channel/Page column to open the Facebook page in another browser tab. Click on the Schedule link. Select Publish immediately to publish the video immediately or select Use Video Cloud start date to use the start date set for the video. You can also Never expire posts or have Posts expire on Video Cloud end date. Click on the Captions link. Select Use Video Cloud captions to use the captions associated with the video or No captions to not use captions. Audience Optimization Interests - Add tags to describe the interests of people who are most likely to enjoy your post. For information, see the Facebook documentation. Who is your business partner for posts to this destination? - Add a business partner for branded content posts. As you type, a list of matching businesses will appear. For information on Facebook branded content, see the Facebook documentation. Note: Your Facebook account must have access to the Facebook Rights Manager for the Rights option to appear. Detect Matching Content - Check to enable Facebook rights management. For information, see the Facebook documentation. Country Selection - Select Worldwide, Include Countries or Exclude Countries. If include or exclude is selected, then add the Location Restrictions. Apply Match Rule - Select a rule. The Match Rule determines what automatic actions happen when people upload matched videos. Match Rules are managed inside of Facebook. Grant Permission - Authorize certain people or Pages or Instagram accounts to have permission to post videos matching your content. 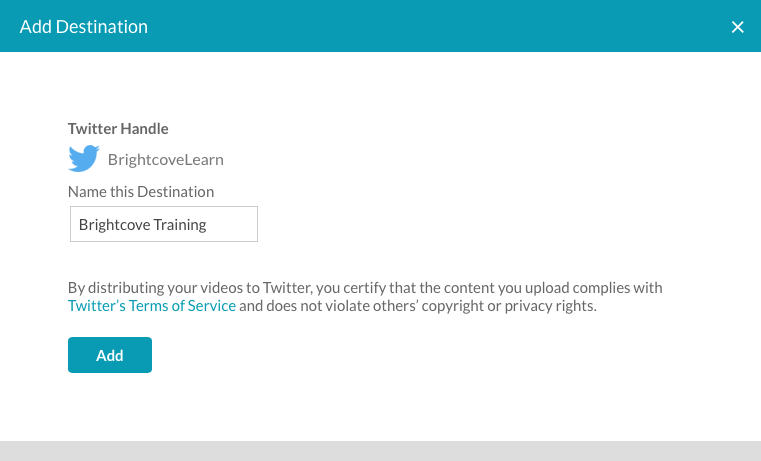 Create a Twitter destination when you want to publish videos to a Twitter feed. To create a Twitter destination, follow these steps. Select Sign in with Twitter. 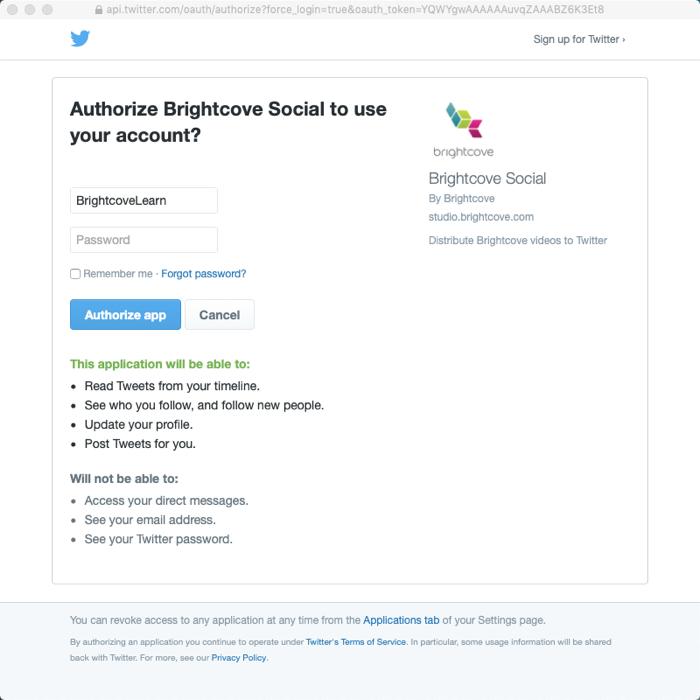 You will be prompted to login to your Twitter account and authorize Brightcove Social to use your account. 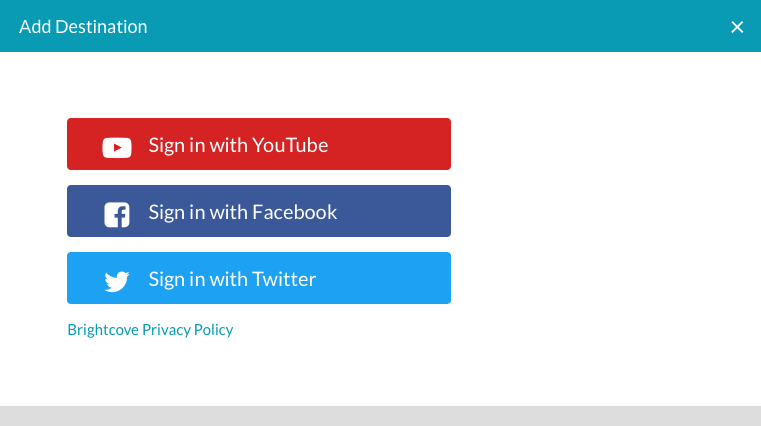 Login to the account you want to post videos to. If you are not prompted to login, you may be logged into a Twitter account. Make sure you are logged into the correct account before proceeding. Click Authorize App. Basic information and the destination defaults will be displayed. Click the Edit button in the BASIC INFO section to edit the destination name. See the Setting Twitter defaults section for information on configuring default values. Click the destination name to edit the destination. Click the link in the Channel/Page column to open the Twitter account in another browser tab. The destination default values will be used as the default video properties when publishing videos to social platforms. To configure publishing defaults for Twitter destinations, click on the destination name and then click Edit in the DEFAULTS FOR THIS DESTINATION section. Click Destinations in the left navigation. A list of destinations will appear. Click the destination name to delete. The destination details will be displayed. Click the delete icon ( ) and then click Delete to confirm the deletion. Note: The delete icon will not appear if there are Auto Sync jobs created that use the destination. You must remove the Auto Sync jobs before deleting the destination. 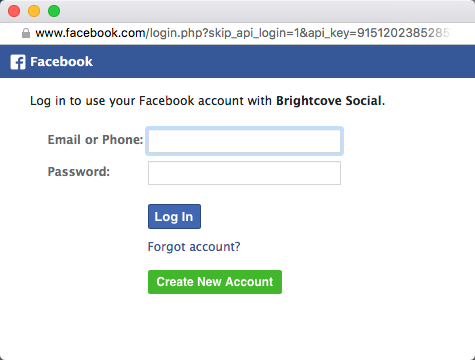 Brightcove Social will display an error message if any destinations have issues. Click the Reconnect link at the top of the page. You may be prompted to reauthenticate with the social media account.